This year we spent Thanksgiving with my Mom's family at my grandparents house in Palm Desert. 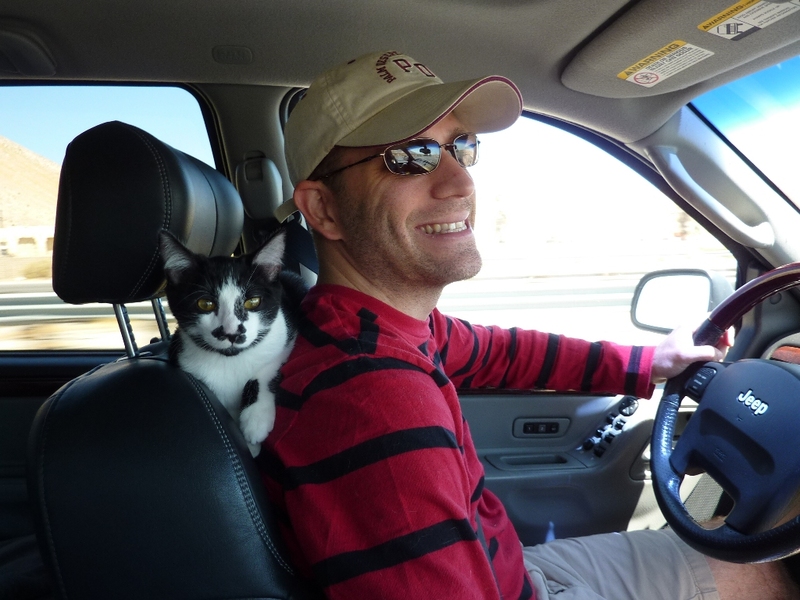 This year was extra special because Hubby and I and our newest cat, Oliver, made the hour and 45 minute drive Tuesday evening before Thanksgiving. We went out early to help Grandma Jane cook and prep for the big day. Grandma has been doing our families Thanksgiving for my entire life. My mom and aunt and I joked that none of us knows how to cook a turkey because Grandma always does it. She puts on quite a spread and thinks of all her guests favorite dishes (even Oliver got a turkey day treat--a small rawhide stick wrapped with dried chicken--which he absolutely loved). The big meal contains many dishes that grace most Thanksgiving tables, like turkey and stuffing (with an extra crispy crust on top), mashed potatoes and gravy, ham, sweet potatoes with toasted marshmallows, corn, cranberry and dinner rolls. She also includes some other special dishes that aren't as traditional, like 7 layer salad (my personal favorite), blueberry pecan salad (my mom's favorite), ambrosia (my cousins favorite) and sweet potato casserole with crusted pecan topping (almost every one's favorite). It's a feast of major proportions and I always look forward to digging in. Grandma serves Thanksgiving dinner around noon. Originally she did it early to accommodate the families that had to go two Thanksgivings in one day. But no one has to tackle two meals in one day anymore. So we do two at Grandma's. The big feast at noon and what I like to call second dinner around 6 pm. I look forward to second dinner just as much as the main event. There is never a shortage of sweets at Grandma's. Every year she makes 3 kinds of pies...pumpkin, pecan and apple. This year she let me make the apple pie using a favorite family recipe from my Dad's family. I had a blast spending the day with Grandma in the kitchen prepping and baking. She even helped me crimp my pie crust edges, a skill I am still working to master! 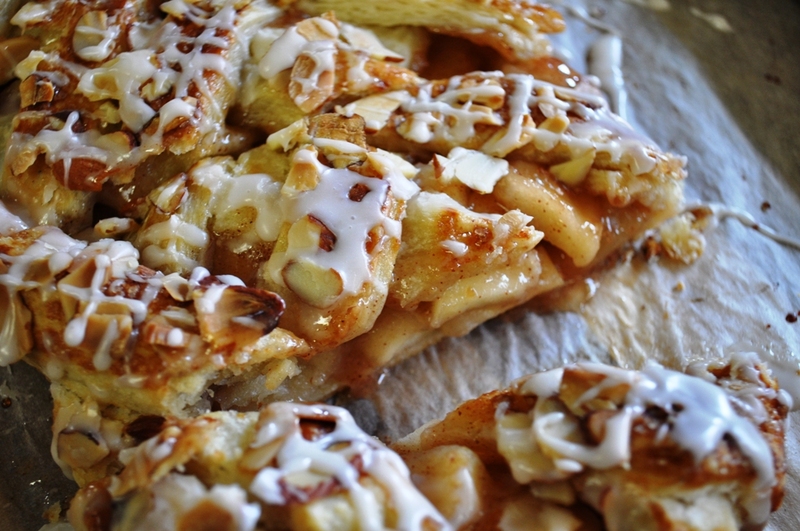 Grandma also helped me develop the recipe for this apple danish filling. I brought the leftover dough from my recent danish pastry making adventure. We whipped up an apple pie like filling to fill the danish on Thanksgiving morning. Between the two of us, I think we came up with a pretty awesome filling that is most definitely going on the recipe keeper list. The filling is sweet and tart, using 2 types of apples. You can change up the apple mix to suit your tastes. 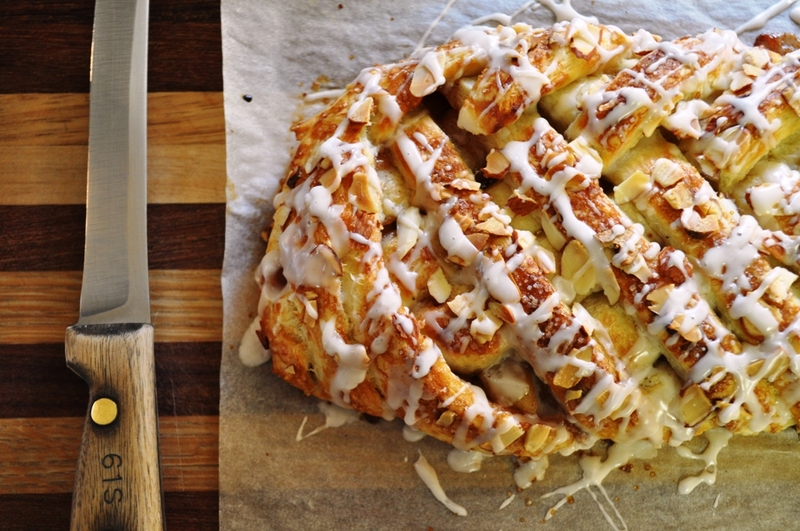 The danish is sweet with the icing on top so if you prefer a more tart filling, you can use all granny smith's. A little cornstarch helps the filling thicken. I recommend making it a day or two before you plan to bake the danish (you can also make the pastry dough ahead). It sets up even more after chilling in the fridge. This filling could be used with other dessert options, like an apple turnover using store bought puff pastry, it could be used to fill a crepe, top a cheesecake, or fill a tart shell. This sweet breakfast treat is best served warm from the oven. 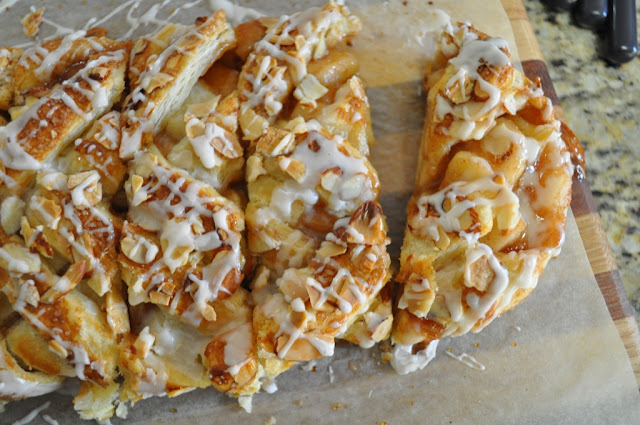 The apple danish was a big hit with my family. I kept hearing, "Wow, you made this?" Which makes me blush a little. I am happy to report there wasn't a speck left over. Hope you all had a nice Thanksgiving and are gearing up for the holiday fun in December! For the danish pastry recipe, including some step by step photos, click here. In a small bowl combine sugar, cornstarch, salt, cinnamon and nutmeg until thoroughly mixed. Heat a medium sized skillet over medium heat and add butter. Once butter is melted add the apples and sugar mixture. Bring mixture to a simmer and stir occasionally and cook for about 15 minutes or until apples are just tender but not mushy and the sauce is slightly thickened. Allow mixture to fully cool before filling the danish pastry. The filling can be made up to three days ahead. Store in an airtight container in the refrigerator until ready to use. I love how your cat chose to sit right on your husband's shoulders - too funny! And how cute is your grandmother? I always miss mine so much this time of year. Your apple danish is stunning, and is absolutely going on my to-bake list asap! 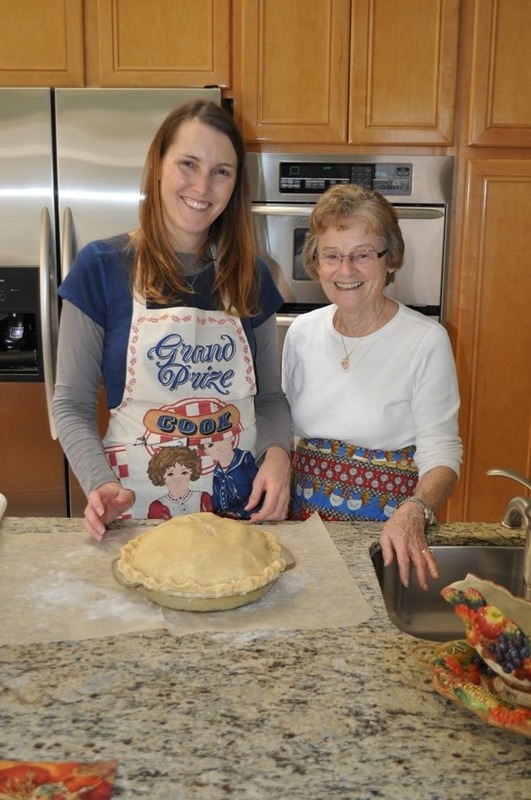 It is just wonderful that you can still bake with your Grandma! She is so tiny, just like mine--what is with Grandma's being tiny? lol! Mine seriously has to buy children's shoes. :) That 7 layer salad is a tradition with our family as well. And the Danish? Beautiful! You deserved all the compliments you got. How special that you made the recipe with your grandmother. It is funny how you stumbled on food blogs just like me, except that I did it much earlier, in 2004. I just sat there and read blogs, mesmerized, ignoring my husband's pleas to start a blog of my own (too intimidated by technical aspects of blogging). If I had known how much joy it would bring me, I would have listened. I am definetely using your danish recipe for a family brunch coming up soon, it looks really tasty! Awesome job..